** Max. playback time achieved with screen saver is enabled and “Lyrics Sync”is disabled. * 1 megabyte (MB) = 1 million bytes; 1 gigabyte (GB) = 1 billion bytes. Some of the listed capacity is used for formatting and other functions and thus is not available for data storage. 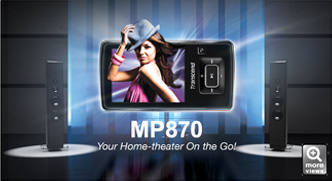 Products The MP870 digital music player comes with a colorful 2.4” high-definition TFT screen and offers over 22 hours of music playback on a single battery charge*. It has abundant built-in memory up to 8GB and a microSD/microSDHC expansion slot, allowing you to store and share more of your video, audio or picture collections—with unparalleled level of audio and visual quality! Aside from RM/RMVB that other brands rarely support, the MP870 is compatible with a variety of popular file formats such as MPEG4 SP (Xvid), FLV, MP3, WMA, WAV, OGG and FLAC (Free Lossless Audio Codec), offering unlimited portable entertainment that you have never experienced before.